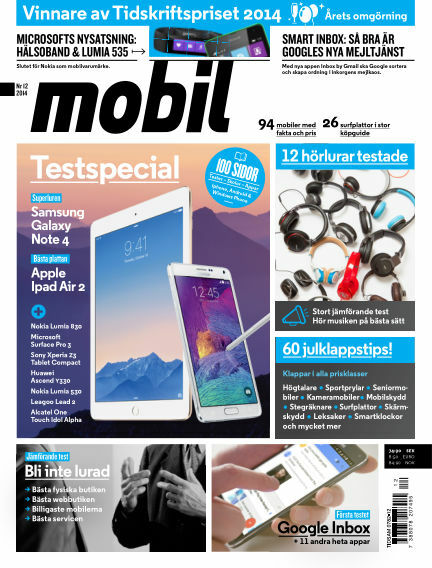 In this issue of Mobil Sverige : Testspecial med bland annat Samsung Galaxy Note 4 och Apple Ipad Air 2. Stort jämförande test av 12 hörlurar. En hel drös julklappstips. Bästa fysiska butiken, webbutiken, billigaste mobilerna, bästa servicen - jämförande test. With Readly you can read Mobil Sverige (issue 2014-12-02) and thousands of other magazines on your tablet and smartphone. Get access to all with just one subscription. New releases and back issues – all included.